MACGP works with other organizations to extend its reach and to elevate the services we provide to our members. We collaborate closely with our parent organization. the National Association of Charitable Gift Planners, to insure that we are informed of changes in the Planned Giving field. 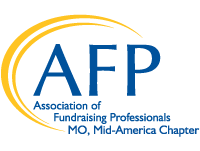 We also have an alliance with the AFP Mid-America Chapter to work on educational and social programs that benefit the members of both groups while cross promoting our keystone events.